Careful Food: Who Stole our Confidence in Food, and How Do We Get it Back? Who Stole our Confidence in Food, and How Do We Get it Back? 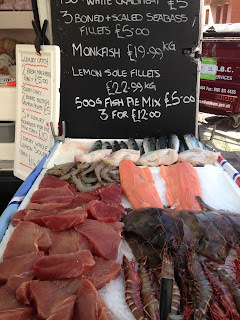 The fish stall on Shaw market is great. 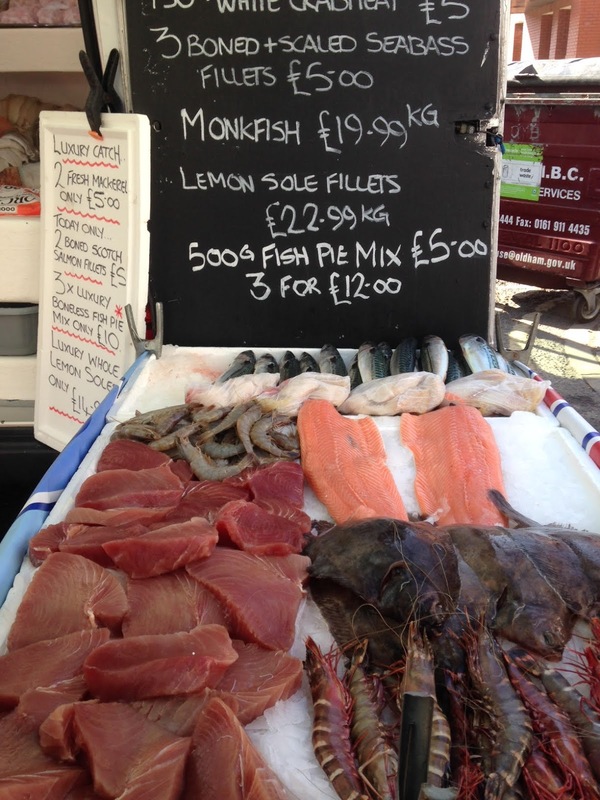 They bring fish fresh from Fleetwood each day, choosing and buying it at the quayside market. I respect their judgement and each week I ask what is best value and pick their brains for cooking tips. I love buying good food from people who know and care about it. Always eager to learn about other good food suppliers, I asked our fishmonger last week, just in passing, where she bought her meat from. She looked sheepish and muttered that everything other than fish is bought from the supermarket. This rings true with a lot of people I speak to. They balk at the idea of admitting to a butcher for example, that they don't know their rump from their tenderloin. Yet in my experience independent food producers and retailers are sitting on a wealth of knowledge and expertise just waiting to be asked. Where did this diffidence come from? It is a far cry from the strong-minded British housewife I grew up being cuffed round the ear by. My mum knew her food, knew what to do with it and how to buy on a budget. Yet even she, thirty of forty years down the line, seems cowed, or almost intimidated, when it comes to buying food and would much rather pick a pre-wrapped packet from a supermarket fridge then engage in discussion with a knowledgeable retailer. I don't buy the idea that we have become lazy and simply opt for convenience. It may well be easy to nip in a supermarket with a list of items that you know perfectly match the recipe from the book of the TV programme, but where did this reliance on spoon feeding from the page to the plate come from? When I was at school in the seventies girls were taught domestic science, boys were not. I was pleased therefore, when my own sons were taught food science. You would think it an improvement wouldn't you? But let's look at what they actually learnt. 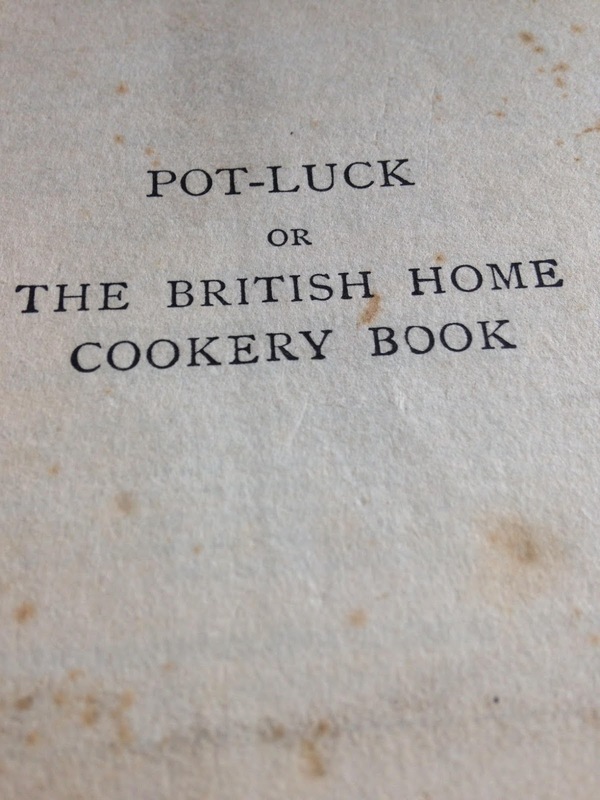 Domestic science in the seventies taught basic baking and cookery techniques. You learnt about staple food items and how to deal with them. Consequently when a recipe told you to blend, saute or brown, you had half of an idea of what was required. When my sons were taught cookery they were taught three or four dishes: pizza and spaghetti bolognese were two of them. This was recipe-based, not skill-based. Now, as adults, they seem ill equipped with few transferable skills from their school cookery course. And then there is telly. We have seen an explosion of cookery-based entertainment that on the one hand scare us to death with complexity: think Heston, or Masterchef, or make us cringe with embarrassment for the competitors when a baked item fails to meet the expected standard of perfection. There are exceptions: I think Jamie Oliver's casual, affable approach is good. His relaxed approach to quantity and measurement is encouraging and is the antidote to Heston's scientific approach for example. Similarly Nigel Slater seems keen to engage and encourage rather than alienate and intimidate, but do these telly-tutorials actually help or influence us? This article in The Guardian suggests that they may, but having bought many cook books written on the back of TV series, most seem to be recipe-based rather than skill based. 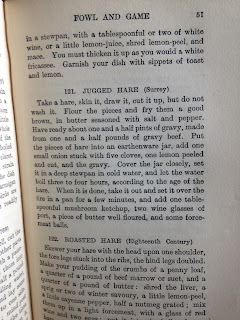 Again there are exceptions, I think Hugh Fearnley Whittingstall's approach is a good compromise between slavish adherence to recipes and the learning of basic skills. 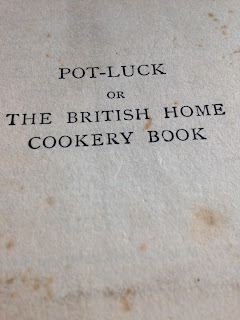 Looking back through our own cook books we found one that used to belong to Mrs C's great-grandma. It is dated 1924. The recipes are an education in what knowledge has been lost. Have a look at the image and see just how much knowledge is assumed in the person reading it! Do I think this leaching of knowledge from the nation's food brain is a conspiracy between media and supermarket marketing? No, I think we are simply seeing the work of highly skilled marketing experts combined with the drive for profit in big retailers. Everything is a commodity: so a skilled chef with a bubbly personality becomes a TV chef and, therefore, a commodity. It suits mass retailers to have us told to think in terms of meals, rather than staple ingredients. 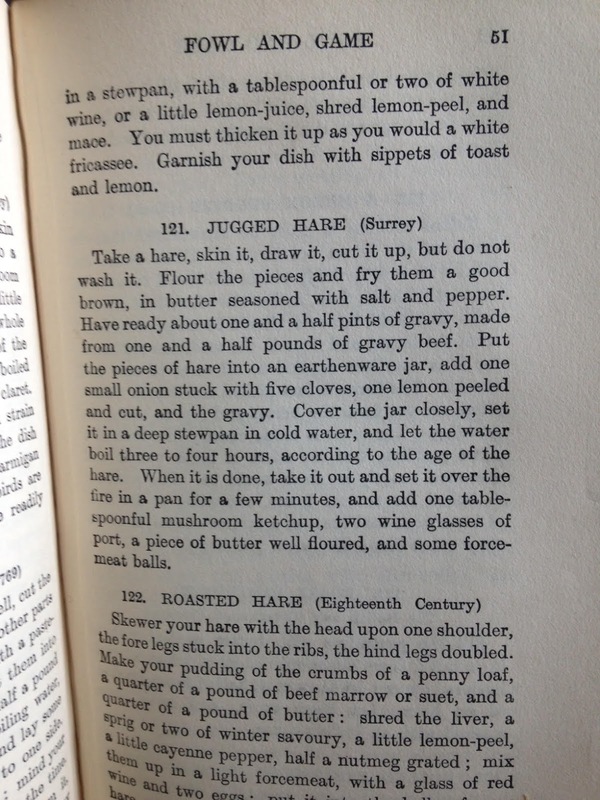 We are expected to flip through a book of recipes and select ingredients to match. So we go to shop with a list based on meals to make, not with a list based on the best value produce available on the day with which to make meals yet to be determined. We are simply not used to thinking creatively about food: inventing meals dependent on the ingredients we have bought. . So, are we lost to the powers of massive marketing budgets and commoditisation? I think not. There are increasing numbers of small local retailers who are focused on building relationships with their customers, and helping them learn more about the food they buy. It might seem counterintuitive for a bakery to teach people to bake their own bread, but that is exactly what dozens of Real Bread makers are doing. Yet it doesn't seem to be denting their retail sales of bread. Or look at some of the winners of last year's BBC Food and Farming Awards: The Food Assembly brings food producers and consumers closer building relationships that would not exist in supermarkets, or Liverpool 8 Superstore, an independent community grocer, again a place where people interact far more around food and produce than what we have come to expect. I think that by engaging with customers in this way there is a buzz that draws in other potential customers and helps to develop a culture around their produce, and hunger for knowledge about food. If anything saves us from supermarkets I believe it will be this development of a food culture, and small local retailers can steal a march on the supermarkets by reaching out to their customers. In my own area Albion Farm Shop offer food events, and I was heartened to see our own celebrity Masterchef winner Simon Wood championing their food and holding a book signing there, rather than in one of our local supermarkets. It's time we took back the confidence in food that has been stolen from us. Let's learn to have fun again, mess about and experiment. And while I am at it, let's ban the term 'foodie', we should all be foodies: interested and passionate about what we feed ourselves and our families. - Cream cheese: it was meant to be yogurt but I lost the yogurt maker instructions so guessed, and then forgot about it for two days. Out came very nice cream cheese. - Saurkraut: we had a huge red cabbage left and I was clueless about what to use it for so Googled ideas. 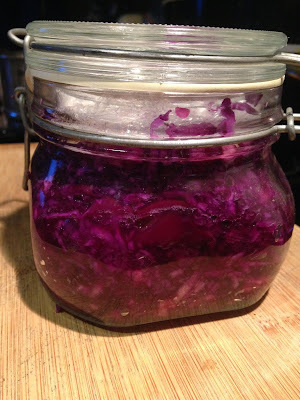 I still have no idea whether Saurkraut should taste like it does, feel free to come and taste it and tell me whether it should be this eye-wateringly salty! My Saurkraut- should it be THAT salty? - Bacon: I fancied a go so bought pork belly. It is in day 3 of curing and looks promising. I'll let you know. Let's rediscover the fun of food, ditch our lists and learn what our grandmothers would have taught us. I agree that limited time is the biggest challenge. Big food producers know this and market to exactly that point; which you wouldn't mind so much if they weren't so disingenuous about what they put in their processed food. I'm convinced that by helping to reignite interest in food in general that people will see food preparation as something worth spending their valuable time on.